Perfect for when you're craving a little afternoon sweet treat to accompany your tea, this gluten/dairy/egg/corn-free fruity crumble wont disappoint. 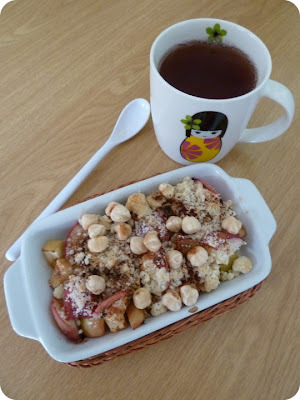 - Cut the apple and peach into bite size pieces, and put them in the bottom of a tiny baking dish. - Mix together the rice flour, olive oil and sugar and sprinkle over the top of the fruit. - Bake until the topping is beginning to brown. - When it comes out of the oven, sprinkle with cinnamon (optional). - Use a dry pan to toast some hazlenuts and then sprinkle them over the crumble (optional). In honour of breast cancer awareness month, Roanne of Ms. Veronica's is hosting a Heart the Boobies auction, all the proceeds of which will go to EmbodiWorks, an organization that educates and empowers people affected by cancer. Please stop by and bid on any items you like, knowing that good will come of any money spent in the auction. Yummy idea, and so healthy! Love how gluten, dairy, egg and corn free doesn't have to mean fun-free! I love fruit crumbles! Never tried peaches with apples, so I guess I have to. And thanks for mentioning the auction. Added some new items this week and there's a giveaway too - http://www.ms-veronicas.com/2011/heart-the-boobies-giveaway/. Keep enjoying your summer:-) I'm missing mine already. MMMMMMMMMMM,...A lovely fruit crumble that looks stunning & wonderful! Yum! And what a good idea to add the hazelnuts! Ciao! ma che bontà questa ricetta! yum...i've been reading a book about peaches to mini-he, so i've been craving a good peach! I love your new header! So nice!!! As is this lovely fruit crumble...fruit desserts are my favorite (especially when peaches are involved!). What a gorgeous tasty fruit crumble! Bookmarking this for my Gluten-Free pals. hey you....just dropping in to say HI! hope all is well! Love the look of that crumble!